https://www.gofundme.com/28jpu8yw - Fundraiser for PAWS! PAWS Cookbooks available for sale for $20 each. 2019 PAWS calendars available for $15 each. Available for pickup at River Valley Vet or Livewire Printing in downtown Jackson. 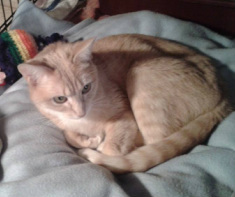 Sweet Mango is a very shy special-needs girl who is very sweet and affectionate in a calm, quiet environment. PAWS is an all-volunteer organization, whose members work full-time jobs in addition to helping animals, so the best way to reach us is via email (pawsofjackson@gmail.com). Text messaging or leaving a voice mail at 507-841-1834 is the second-best way to reach us. PAWS is foster-based, with many animals on a waiting list for foster homes, so we are unable to accept animals at short notice. If you can foster the animal you need re-homed, we are happy to post them here and on Facebook, to try to help you find a good home for them, however. 1) foster homes, especially for cats, as we are currently foster-based only. 2) someone with the time and energy to assist with paperwork. 5) assistance with fundraisers - either working at them, or prepping for them. All you have to do is click a button once a day to help animals! A couple of more clicks (Shelter Challenge tab, then follow the instructions to find PAWS in Jackson, MN) helps us have a chance to win cash to help our local animals! If you wish to mail a donation, please mail to PAWS, POB 185, Jackson, MN 56143. If you are interested in adopting one of our available animals, or if you are available to foster, please contact us at pawsofjackson@gmail.com or text or call 507-841-1834 and leave a message.